The first of the preseason football magazines are out. Even in the digital age, I still have an odd fascination with them. I buy most every one I see. and especially look forward to the release of the Phil Steele college football edition. An item in the Lindy's Pro Football magazine did catch my eye. It was a comment from Howard Balzer, who has covered the NFL for a long time. The magazine is predicting the Lions will finish last in the NFC North and not make the playoffs. Balzer has a one-line comment about each team. About the Lions he wrote: "There's Stafford and Johnson and Bush and Suh, but there's just something that seems missing with this team." 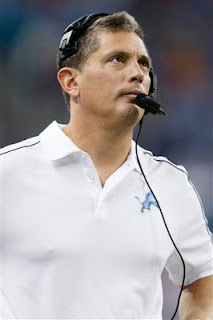 Jim Schwartz: Can he bounce back? To me, that comment reflects poorly on coaching. 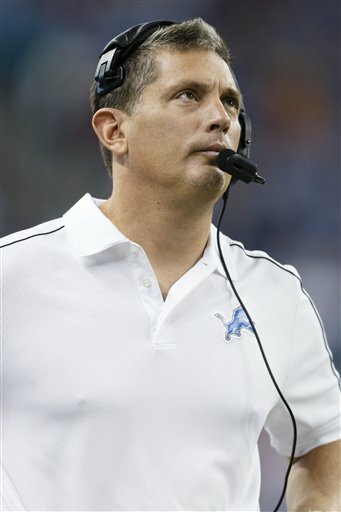 Now, I think Jim Schwartz is a good coach. I believe he can take the Lions to the playoffs and on a run to the Super Bowl some day. He has the background, and is smart and savvy. He also had a dreadful 2012 season that is indefensible. An educated guess, after talking to literally hundreds of people on 97.1 The Ticket on the subject, and through Twitter (@patcaputo98), I'm in the minority in this town with the notion Schwartz is "a good coach." I believe he will learn from his mistakes and this season will be more like 2011 than 2012. Perhaps it is partly because of the Red Wings' unexpected playoff run, and the interest in the Tigers being very high, but the Lions have been a little under the radar this off season. I liked their draft. Time will tell how it will ultimately pan out, but each pick had a purpose for once. It was at least better planned. There appears to be a regrouping in Allen Park in preparation for the 2013 season. Last off season, the Lions, after a 10-6 season, making the playoffs for the first time since 1999 and the subsequent building hype about their success, got distracted on a number of different levels. ill find it during the coming season. Pat, like every year and this is no exception as long as the injury bug stays away. They seem to improve their secondary. The only spot I think is lack of depth is LOT. They seem to have depth at the other positions but how good is the depth? Lions should do better than last year and be knocking on the playoff door. Who do think you're kidding, Book? The Lions have had clueless ownership since the Fords bought them, a merry-go-round of stooges and bumblers in the front office, and wacky or incompetent head coaches. Every chance a free agent gets a chance to bail, he does. Barry Sanders walked away from $8 million guaranteed bucks, much bigger money 15 years ago, because he couldn't take it anymore either. In case you haven't noticed, Schwartz has, by far, the worst career record of any coach in the entire NFL. Any other self respecting NFL team would have dumped him in a heartbeat after last year. He's not only a loser, but an arrogant hothead. Hype it all you want, but the Lions are going nowhere this year, or any year soon. They need to blow it up and start over again. Knocking on the playoff door? Are you, Barry, the guy that thought the Lions would go 8-8 with 4 games remaining at 4-8?? ?